The National Press Foundation is soliciting entries for the Carolyn C. Mattingly Award for Mental Health Reporting, which recognizes exemplary journalism that illuminates and advances the understanding of mental health issues and treatments for the illness. Deadline to apply: Friday, March 10. The award, which carries a $10,000 prize, was established in memory of the Potomac, Maryland, philanthropist and activist. The Mattingly family established the award in the aftermath of her tragic death in 2014. “The Luv u Project strives to advance mental health through education and responsible actions. 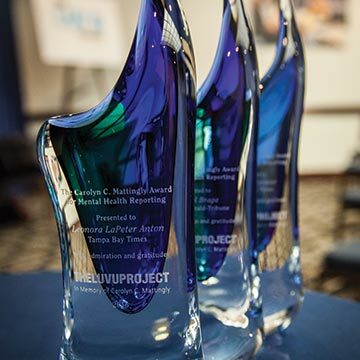 This award does just that by bringing the challenges and facts of mental health to light, which are often an important ingredient in the acceleration of positive change,” said C. Richard Mattingly, founder & president of The Luv u Project. The inaugural Mattingly award in 2016 drew more than 50 entries. The winning entry was a collaborative investigation by the Tampa Bay Times and Sarasota Herald-Tribune that exposed harrowing conditions at Florida’s institutions for the mentally ill. Read the five-part project, titled “Insane. Invisible. In danger.” The winning journalists also shared their reporting techniques in this NPF video. *A haunting story about a 77-year-old homeless woman who died alone on the streets of Sacramento, California. The Sacramento Bee pieced together an illuminating portrayal of the devastation wreaked on the woman’s family by her mental illness; she was so estranged from her children that they did not even know she had died. *An ABC News “Nightline” project focusing on interaction between law enforcement and the mentally ill, which often ends in violence. Police in Texas are developing techniques to deal with mentally ill people without resorting to gunfire. *Jonathan Cohn, reporting for Huffington Post Highline, wrote “Stop the Madness,” about new approaches to dealing with schizophrenia including the moderated use of drugs plus behavioral therapy. Note the fascinating interactive created by an artist with schizophrenia to take you into his world. *A touching mother’s story by Carrie Seidman of the Sarasota Herald-Tribune about raising a mentally disturbed son, who eventually was diagnosed with schizophrenia. It is a harrowing tale, describing in detail what one mentally disabled person can go through growing up. *This nine-minute video by Gisela Telis of Arizona Public Media offers a sophisticated understanding of the lack of mental health services in rural Arizona that contributed to the suicide of a depressed young man. It takes a multi-dimensional look at what all sectors of society need to do to provide help to the mentally ill.